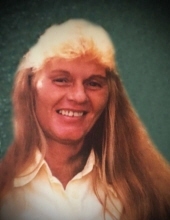 Bonnie Baldridge, age 65 of Sadieville, Kentucky, passed away on Monday, April 1, 2019 at her residence. She was born May 31, 1953 in Prestonsburg, Kentucky to the late Russell & Marie Williams Howell. She was the wife of Ralph Baldridge. Along with her husband she is survived by her Daughters: Bambie Baldridge, fiancée Shawn Gray of Lexington, Kentucky & April Baldridge Campbell, husband Christopher of Sadieville, Kentucky; Brothers: Russell Howell of West Virginia, Estill Howell of Ypsilanti, Michigan, Ronald Howell of Prestonsburg, Kentucky & James “Pig” Howell of Prestonsburg, Kentucky Sisters: Dora Slone of Prestonsburg, Kentucky, Phyllis Gonzales of Missouri, Lorine McCurdy of Ypsilanti, Michigan, Kimberly Chandler of Lexington, Kentucky, Carol Haefling of Texas & Janie Murphy of Paintsville, Kentucky; Grandchildren: Christopher “CJ” Gray, Donavan Campbell & Chase Campbell. Along with her parents she was preceded in death by her Brother: William Dean Howell; Sister: Jerie Vanhoose. She will be missed by all that knew and loved her. "Email Address" would like to share the life celebration of Bonnie Baldridge. Click on the "link" to go to share a favorite memory or leave a condolence message for the family.